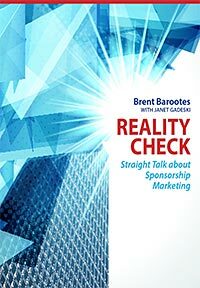 How effective can sponsorship marketing, or traditional advertising and marketing be? Recently, the Partnership Group – Sponsorship Specialists™ engaged Derek Mager to conduct a quick poll on brand loyalty for us. This online panel surveyed over 2000 Canadian residents with a margin for error of 2.2% at a 95% confidence level. When you poll this number Canadians to investigate topics such as this, you get some pretty accurate and interesting results. Because we have seen these results in the Consumer Sponsorship Rankings and other research studies, we expected to see that Canadians are more “somewhat” or “highly likely” to switch brands when the affinity is with a charity or the arts than with sports. The results showed that less than 40% of Canadians will switch brands when a brand supports their favorite sport or sports organization. Almost 58% will shift when the brand supports their favorite charity and 51% when the band aligns itself with an arts organization. Not unexpectedly, men are more likely to be swayed to shift when the affinity is allocated to sports than women by a difference of almost 15%. Two additional points were truly interesting. One was that both women and men rated 62% likely to switch because of an affinity with the arts. So the two are tied, and even men are more likely to make that switch based on an association with the arts over sport, but only slightly. The second big “ah ha” was not only that both men and women are most likely to shift brands when that brand associates itself with a charity. For men, that number was 66.5% or about 5% higher than sports. For women, a stunning 77+% said they would switch to a brand that supports their favorite charity. This is 30% higher than their affinity with sports that brands align with and 10% more impact than males with brands that line up with a charity. So overall, charities provide the best brand alignment and cause marketing channels. When the numbers are broken down by age group, there were some important outcomes, both affirmations and surprises. The under-21 age demographic is clearly the most likely to be swayed. Buying patterns and brand loyalty are not yet fully in place. The numbers were very high and dwarfed the switchover appetite of older people in the arts (where over 73% were somewhat or highly likely to make the switch) and charity (an astounding 85%), while the affinity for sport and brand association was lowest for the age groups of under-21, 21-35, 36-50, and 51+. All four groups showed a greater affinity for brands that support the arts and charity over sport. The 36-50 age group was least likely to make the change. We undertook this research and other proprietary research to ensure that our Partnership Group – Sponsorship Specialists™ consulting team from across Canada provides our clients with the right information; the most accurate and applicable research, and in-depth understanding to assist them in making the right choices for their sponsorship marketing programs. So what does just a little bit of this proprietary research show us? 1. Sport does not have the affinity to drive change as much as the arts or charities. But in my opinion, sport delivers affinity programs and interactive and fan experiential marketing much better than the arts and charities (there are some exceptions, such as but not limited to the Canadian Breast Cancer Foundation CIBC Run for the Cure) and thus reaps the rewards. If the arts and charities could better understand how to harness this opportunity and do it correctly instead of unprofessionally and randomly, they could benefit tenfold over what they are now doing. 2. Women are much more likely to make a brand shift and influence brand shift around an association with the arts and charities than men, even more than men with sport affinities. Again, this works well for some programs, such as but not limited to the Re//Max – Children’s Miracle Network program with the female influence in home buying, but in most cases, the arts and charities fail to recognize the strength of the female buying position, and the strength of brand affinity to their organizations and how it can deliver results for a brand. Too often, they want it “all to happen now” instead of building a relationship and nurturing a brand affinity program to yield results in an exponential way down the road when done professionally with support they presently do not have in-house. 3. The under-21 audience shows the greatest ability to shift and make a stand—and in astronomical numbers. In my mind, this was proven successfully to the theatre-going demographic by Scotiabank and the Scotiabank Scene card and Tim Horton’s and its Timbit soccer and hockey programs. In my opinion, no one has done a better job of targeting and delivering tangible and measurable results with this age demographic than these two brands through affinity programming and experiential sponsorship marketing. There is a great deal of information to be gleaned from an investment in research. When you drill down, you can learn an amazing amount and make better investments. Our Partnership Group – Sponsorship Specialists™ investment in research such as this and the Consumer Sponsorship Rankings is designed to ensure that our consultants are armed with data that allows our clients to stand apart from their competition, with more informed decisions to make better investments in sponsorship and gain better ROI from those investments. My question for all the properties, agencies, and brands out there is: What sort of research are you (or your agency) undertaking to ensure that you make informed decisions? As the Canadian Sponsorship Landscape Study has shown, our industry does not invest enough in research. If we did, perhaps we would all do even better. These are just one person’s thoughts. Yours are welcomed as well. Please add your thoughts or comments below. Thank you for reading and your feedback.